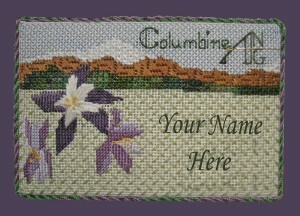 MAY 18: Expect some help getting your Colorado Columbine Chapter name tag finished as we tackle this easy design by one of our own designer-members, Jennifer Riefenberg. Here is the link to instructions & threads. Our president and programs chairs, Gloria & Barb, are preparing the canvas needed to work this project. Check the thread list, bring 8″ x 8″ bars, pull some goodies from the ol’ stash, and come with needle loaded for some fun stitching! 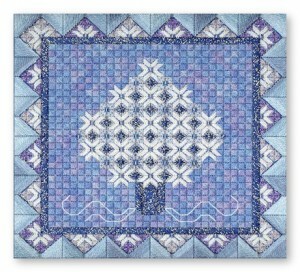 It’s a lovely columbine design that can certainly be varied by each stitcher. Fancy a new magnet? Get a glittery, S-T-I-T-C-H magnet from ANG. See Julie S. at the MAY meeting to put in your order. Cost is just $20, checks made out to CCC-ANG, and the chapter will pick up postage. JUNE 15: You’ve seen him, fallen in love with him, signed up for him and now will create him: Libby Sturdy’s ‘Mile High Santa,’ a charming, Colorado-themed design that will be taught by our president, Gloria. Here is her finished standup, is below. Stitchers taking the class will be provided with an 18-count canvas that has a design already drawn. Stitch guide is included. There will be some surprises offered, so sayeth the grapevine, so be on time for this anticipated class! 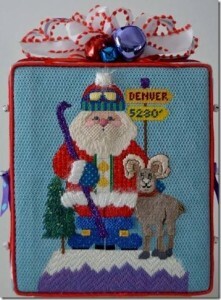 JULY 20: Put the final flourishes onto your delightful ‘Mile High Santa’ and plan his display as… what, a standup? A framed piece for the mantel? The center of a holiday pillow? The choices are many, and yours. AUGUST: Take a break from meetings, but never from stitching, right? No formal gathering, but plenty of lazy days for tackling that stash of WIPs! Make us proud! SEPTEMBER 21: A delightful design, all sparkly and wintery, is planned for the fall months at CCC-ANG. See the piece, below, called ‘Snow Crystal Tree’ by Nancy’s Needle, which will be taught by Barb G. Cost is $15 for directions and beads (!) and signups will be taken at meetings May-July. Design size is 8.3″ x 8.3″ on a 12″x12″ canvas. OCTOBER 19: Last touches of ‘Snow Crystal Tree’ will be added — think beads and sparkles! This piece is a wonderful winter design, not necessarily holiday oriented, so it can be enjoyed all season. NOVEMBER 16: It’s our tradition to enjoy a holiday gathering, so expect an enjoyable social event with your stitching friends, old and new! DECEMBER: No meetings, but there may be a field trip or two in the works. Watch this space!